When starting a heritage album for the first time, it can seem intimidating. But, it doesn’t have to be! There is no right or wrong way to scrapbook. It is all about being creative and preserving history, so you can’t really mess it up. If you have the attitude that you are going to have fun with it, it really does take the pressure off! What is my budget?– Scrapbooking supplies are expensive. Start out by figuring out how much money you are willing to invest in this hobby. The truth is, you can make scrapbooking as simple, or as elaborate as you want. Chances are that if this is your first album, you will start out simple. However, there are plenty of classes, and materials out there to get you started on something more intricate if that is the look you want. What is my style?– This can be a tough question. You want the heritage album to reflect your artistic abilities. Aren’t sure what you like? 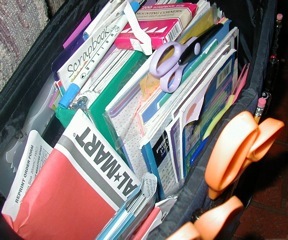 Well, then start with looking at a few scrapbooking magazines and see what you like. This will help you get an idea of where you should start. Once you know the style you like, you can decide how you can go about achieving that same look. It may involve copying what others have done. This is OK. Many beginning scrapbookers simply copy what they like, and there is nothing wrong with that! How much time do I want to devote?– It is easy to get wrapped up in this hobby and spend your days and nights scrapping away. For some people, that is not realistic. However, it’s important to ask yourself this question because it may help you decide how much money you can invest, and give you a more realistic idea if the style you like is achievable. More intricate pages take more time. They also take more tools and embellishments. If you simply don’t have a lot of time, that may make your decision easier regarding what kind of scrapbook you can achieve. How do I want to organize my albums?– You can organize an album by chronological date, which seems the most obvious, but you can also organize by themes, or by family groups. For example, you may want to devote an entire album to one certain family. You can always scrapbook chronologically within each album that you create. What do I do first?– If you have all of your supplies in hand, and you’ve answered the above questions, then you are probably ready to get started. For ideas for that very first page, check back tomorrow for my article, The Title Page for your Heritage Album.